German state-owned bank Norddeutsche Landesbank Girozentrale is headed toward a public sector-backed recapitalization, likely spelling the end for an alternative private equity option, but state aid rules could complicate matters. NordLB urgently needs a solution to plug a capital hole, opened up by its push to reduce its soaring shipping loan portfolio. The scales are currently tipped in favor of a rescue plan partially financed by the German savings banks after their umbrella organization, the DSGV, approved a capital injection of €1.2 billion on Feb. 2. The regional government of the state of Lower Saxony, which has a 59.1% stake in NordLB, has also backed the savings banks' proposal. The state has committed to grant NordLB €1.5 billion in capital and another €1 billion as a state guarantee. NordLB said Feb. 2 that its owners will, for now, not pursue further a private bid received in late January. U.S.-based private equity funds Cerberus Capital Management LP and Centerbridge Partners LP are said to be behind the bid for a joint minority stake. NordLB's owners also include the state of Saxony-Anhalt and regional savings bank associations. "The public-sector solution is likely to turn out cheaper than a sale to private equity or resolution and [be] politically more palatable," Scope Ratings said in a Feb. 7 note. Furthermore, it has potential benefits for the whole public bank sector in Germany, Scope said. Politically this is "a big victory" for the DSGV, which will push hard to make this the first step in further sector consolidation, they said. But a rescue of NordLB by public banks and its state owners could be hard to push by EU regulators, according to analysts and market observers. It is not certain the EU would agree that the proposed plan is "state aid free," and would not require further restructuring or burden-sharing with bondholders, Elisabeth Rudman, head of the EU financial institutions group at rating agency DBRS, said in an emailed comment. Scope also said getting approval from the ECB and the European Commission would be difficult and would take a few months. "On the face of it, the rescue of NordLB by Lower Saxony is state aid," economist Nicolas Veron, who is a senior fellow at Brussels-based think tank Bruegel, tweeted Feb. 7. As such it should trigger a so-called bail-in of part of the bank's capital under the EU resolution framework; if that does not happen it would suggest preferential treatment of Germany, he said. However, according to Moody's, previous state aid investigations under the European Bank Recovery and Resolution Directive may provide arguments in favor of the NordLB owners' view that the recapitalization is not in breach of EU state aid rules. In an emergency parliament session Feb. 5, Lower Saxony's Finance Minister Reinhold Hilbers said the €2.5 billion in capital and guarantees for NordLB will not come from taxes. Financing will be provided through an investment vehicle and all costs will be covered by dividends from the newly restructured NordLB, he said. The state's recapitalization plan includes a significant reduction of NordLB's €154.8 billion balance sheet and headcount of 5,650. The goal is to shrink the balance sheet to some €100 billion and boost the common equity Tier 1 ratio to 14%, Scope said. 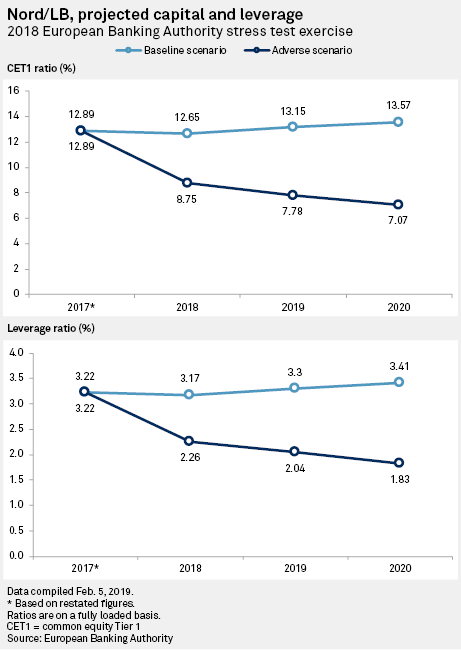 NordLB will end up cutting far more than the already announced 1,250 jobs by 2020, the rating agency added. NordLB's CET1 ratio, a key measure of a bank's capital strength, was 11.80% as of Sept. 30, 2018. 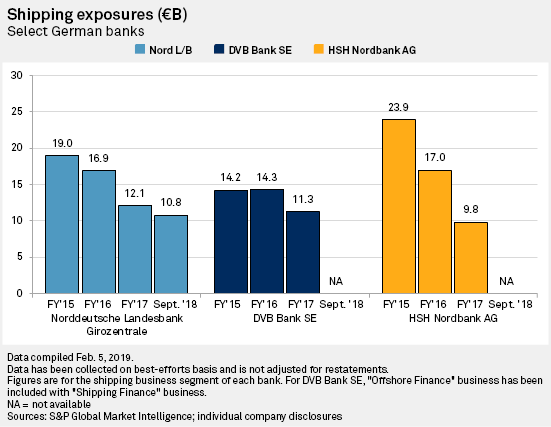 NordLB cannot afford to ponder its recapitalization options for too long as it wants to expedite the disposal of its bad shipping loans and needs capital to do it. Previously, the group sought to reduce nonperforming shipping loans to below €5 billion by the end of 2019, from €7.3 billion as of Sept. 30, 2018. Now it wants to end 2019 with no shipping NPLs at all. NordLB's total shipping book amounted to €10.8 billion as of Sept. 30, 2018. The bank has already agreed to sell €2.7 billion of shipping loans, 90% of which are NPLs, to a private investor, which is widely reported to be Cerberus. The bank said Feb. 2 that it expects risk provisions for 2018 of up to €2.5 billion and will incur a full-year loss of €2.7 billion. German regulators have said NordLB can operate on a temporarily low CET1 ratio of between 6% and 6.5% before the state capital injection takes effect, Scope said. This compares to the 10.5% minimum required by the regulator. NordLB will also cancel coupon payments on its Additional Tier 1 bonds, the rating agency added. NordLB expects to complete the recapitalization by September.